Broadway, Manhattan’s longest street and a main commercial drag, spans the length of the island from hilly Inwood to Lower Manhattan’s breezy Bowling Green. There are shops from nose to tail, but a recent survey found that Broadway is also home to almost 200 vacant storefronts, dead zones on one of Gotham’s liveliest thoroughfares. Glaring vacancies aren’t limited to Broadway though. 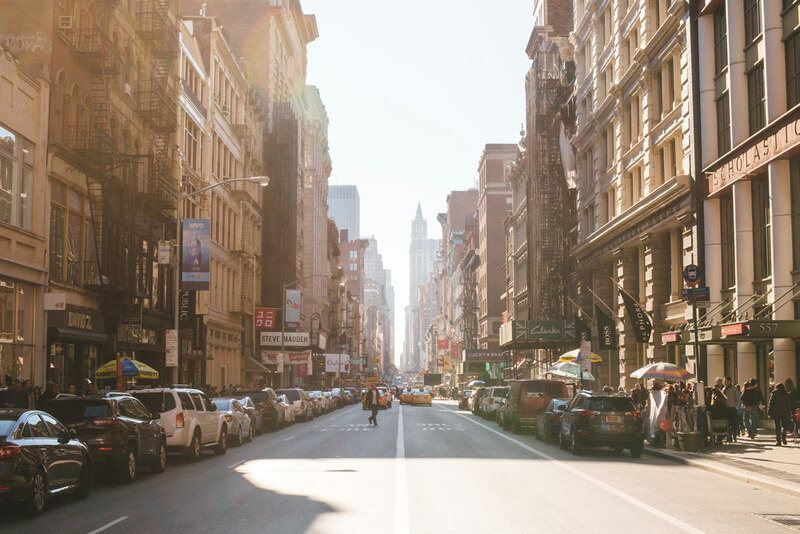 From Madison and Fifth Avenue to Broadway in Soho and Bleeker Street in the West Village, high-end commercial strips in Manhattan are having trouble attracting commercial tenants. A healthy vacancy rate is 5 percent, but some fancy areas are in the midst of high-rent blight, with one in five (20 percent) storefronts vacant. Further north, in Washington Heights, a whole block of immigrant-owned businesses were essentially evicted after new landlords proposed a 100 percent rent increase and declined to renew their leases. The causes are predictable, but the solutions are not. High rent, high taxes, regulations that favor owners over tenants, and plain old capitalism—the incentive for owners to seek their property’s maximum value, and the consumer’s desire to acquire goods at the lowest price—all contribute to the twin plagues of vacancy and the mall-ification (national chains displacing small, local businesses) of Manhattan. 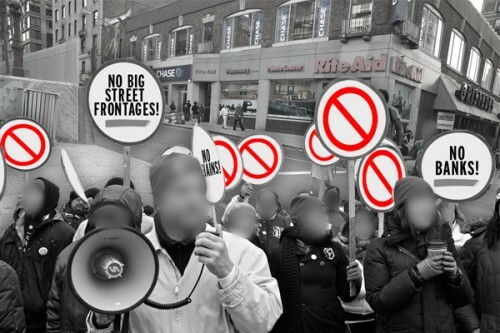 Stakeholders, though, disagree on what should be done to solve a growing crisis at street level. 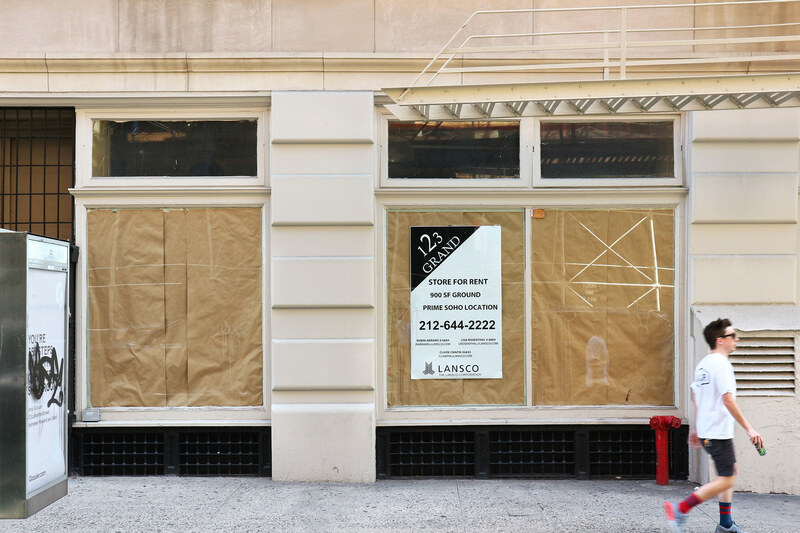 This spring, the Manhattan Borough President’s Office (MBPO) recruited volunteers to count all the vacant storefronts along Broadway, citing a dearth of information on how many vacancies exist, and where. The survey follows an effort from two years ago where the office reached out to small businesses and offered potential policy solutions to businesses’ problems. But first the report had to determine what a small business is, a question that is not as obvious as it seems. The federal government’s Small Business Administration (SBA) measures business size by number of employees or the company’s value, depending on the sector. The Small Business Act, though, uses a measure that doesn’t exactly conjure visions of mom-and-pops: It says small businesses have fewer than 500 employees. Under the same rules, a microbusiness has fewer than five employees and requires $35,000 in capital or less to get going. In New York State, small businesses are companies that employ fewer than one hundred people, while New York City’s Department of Small Business Services doesn’t set a number. Instead, it encourages any self-identifying businesses to seek out its resources. Consequently, the MBPO’s March 2015 report called for a standardized measure of “small,” and the recommendations in its report are geared toward firms with 15 or fewer employees. No matter how you define them, it’s clear that the not-so-invisible hand of the market is driving these firms out of business on Manhattan’s main streets. One problem? Stratospheric commercial rent increases. In 2014, the average asking rent in Manhattan was $65.14 per square foot. With ever-more high-income individuals flooding Manhattan, landlords are reluctant to offer 10- or 15-year commercial leases lest they get stuck with a lower-paying tenant as commercial land values in the neighborhood skyrocket. Other problems, the report found, include businesses not having enough insurance, delaying tax payment, and under-budgeting for utilities. On the city side, some business owners in the report cited punitive agency inspectors who, instead of working with the owner to correct an issue, slapped the business with a fine. Additional solutions don’t seem politically viable or aren’t effected at a scale that works. A special tax for businesses in most of Manhattan eats into viability, too. In June, Mayor Bill de Blasio rejected the city council's proposal to alter commercial rent tax, an almost four percent surcharge on annual rent of $250,000 or more on businesses below 96th Street. As rents have risen, the tax threshold has stayed the same, and more businesses have become impacted. A bill (sponsored by Councilmember Dan Garodnick) that would raise the ceiling to $500,000 in annual rent didn’t make it into the final 2018 budget, though the item could be considered at a later date. If that limit were approved, the city would lose $52 million in revenue annually. Zoning regulations encourage new development with huge storefronts that work for Chase and CVS but not for their independent counterparts. On the Upper West Side, though, neighbors are seeing mixed success from initiatives like a 2012 zoning change that limited storefronts to 25 feet, but don’t limit store size, as businesses are free to expand up or down as space permits. But some advocates say these reforms don’t go far enough to stop business closures and the encroachment of chain stores. Her group supports the Small Business Jobs Survival Act (SBJSA), a piece of local legislation that would set new rules around renewing commercial leases. Among other provisions, SBJSA would give commercial tenants, at minimum, a ten-year lease plus right to renewal and the option of arbitration to come to a new rent. The legislation is designed to slow, not stop, the rate of change in neighborhoods, and level the playing field for florists and bakeries competing for storefronts with Starbucks and Pottery Barn. Even real estate boosters, though, acknowledge the downtrends in the market. According to REBNY, average asking rents in Manhattan this past spring fell in 14 of 17 of the borough’s top shopping strips compared with 2016 and record highs in 2014 and 2015. But the group maintains that a variety of factors set Manhattan apart from the suburbs, and grant the city a degree of immunity from experts’ dire predictions about the death of retail. In New York, REBNY says there are “strong market fundamentals,” including diverse food tenants, online retailers opening storefronts, and the eternal cache of a New York, NY address. But to REBNY, doing well means collecting more rent. Fifth Avenue between 14th and 23rd streets (the Flatiron Fifth Avenue corridor) and Broadway between Battery Park and Chambers Street (the Lower Manhattan corridor) did the best, with ground floor rents rising by 18 percent to $456 per square foot in the Flatiron and 11 percent to $362 per square foot along the Lower Manhattan corridor. The report only looks at rents along main strips. Rents on side streets, according to the report, could diverge from the main drag; conversely, a gorgeous space on a prime corner may command greater asking rent and affect averages all along the strip. It’s not only high rents and taxes that are driving businesses to close. Online shopping is slaying retailers big and small, in Manhattan and the suburbs and beyond. Right now, unchecked real estate speculation and limited protections for small-business owners mean that there is little protection against ultimately having a national bank and pharmacy on every corner. An interstate conspiracy against Florida real estate? 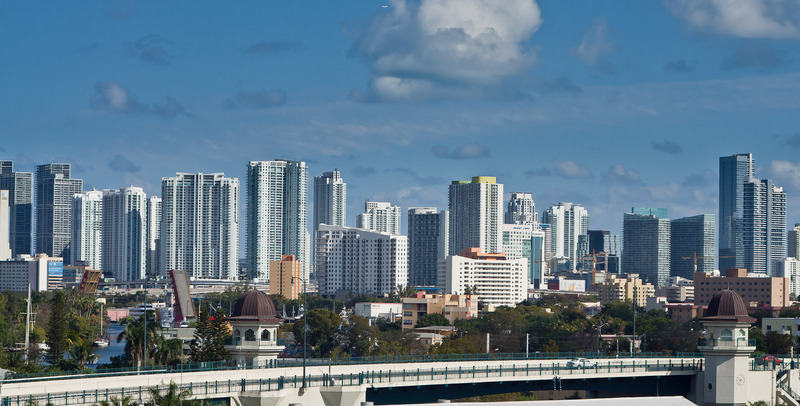 A developer in Miami said that there is an interstate conspiracy against South Florida architecture. “We would sell way more real estate here if the Real Estate Board of New York (REBNY) would stop telling everyone that Florida was sinking!” Sources have not confirmed whether either claim is true: the conspiracy or the sinking. 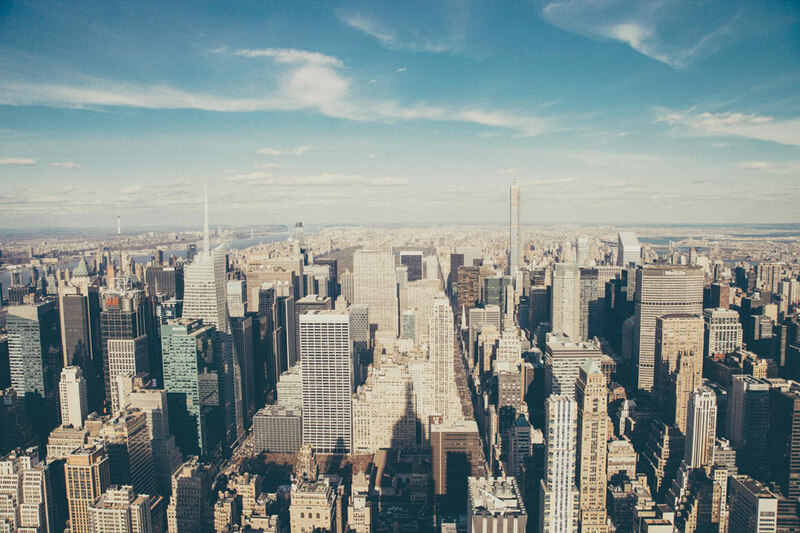 Thanks to some high-level maneuvering between feuding leaders, New York City is set to increase its capacity to build affordable housing. Last Friday, Governor Andrew Cuomo announced the state would grant $300 million in bonds to build or refurbish low- and moderate-income housing. The governor's okay raised the city's 2016 tax-exempt bond capacity to $771 million, the largest increase in a decade. "Homelessness is exploding and affordable housing is all but disappearing,” Cuomo said in a statement. “New York City needs this help from the state which will provide thousands of units of safe, clean, affordable housing and will help alleviate this crisis.” In another instance of state-city tensions, the state, per federal law, controls bond capacity, and that control has escalated tensions in the perpetual rivalry between Cuomo and Mayor Bill de Blasio. Yesterday, though, the mayor's administration got to celebrate. "This funding is critical to keeping our affordable housing engine in high gear,” de Blasio spokeswoman Melissa Grace told the Daily News. “With so many vital projects lined up—including homes for low-income families and homeless seniors—we are grateful the State is coming forward with this additional $300 million allocation." Last year, the state gave the city $694 million in bond capacity, which was less than the city expected and delayed construction of affordable units, the mayor said. Friday's announcement comes on top of last week's deal between the Real Estate Board of New York (REBNY) and the Building and Construction Trades Council that seems set to revive 421-a (even after they temporarily reneged over a misunderstanding on the agreement's wage rates). 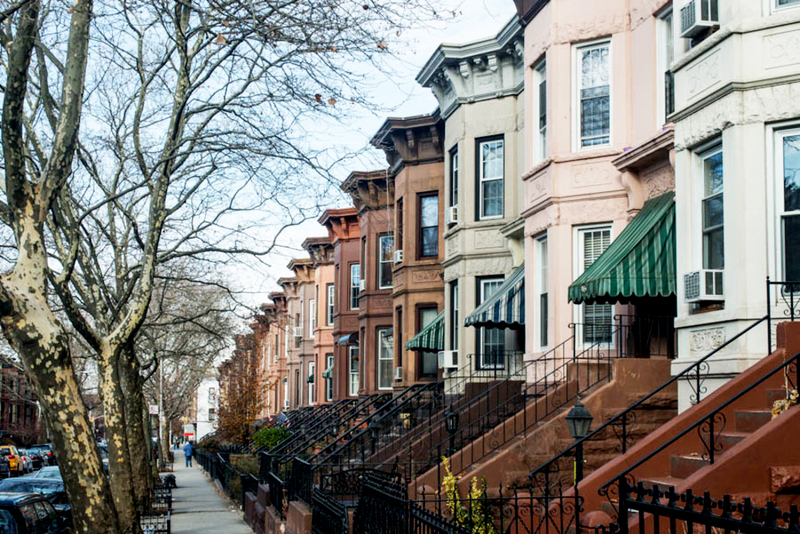 Although housing advocates say the new exemption could cost New York billions in lost revenue each year, REBNY says the housing tax credit is essential to building affordable housing in the city. Union leaders and real estate power players have brokered a deal to revive an expired property tax break that many see as key to developing affordable housing in New York. The two groups agreed on a multipart deal to revive 421-a, one of the largest property tax exemptions for rental housing in the city. In its expired version and its just-forged incarnation, 421-a gives developers tax breaks for constructing multi-unit buildings on vacant land in certain areas of the city. The deal expired in January when the Real Estate Board of New York (REBNY), an industry association, and the Building and Construction Trades Council of Greater New York (BCTC), an organization of building trades unions, could not reach an agreement on wages. Real estate developers said they could not finance affordable housing projects and pay the wages unions demanded, while unions argued that wealthy developers could pay, but didn't want to cut into profit margins. Unions also argued that their knowledge of workplace safety and skilled labor pool create job sites that are safer than non-union ones. One major part of the new deal is that union construction workers on 421-a property tax exempt projects be paid an average of $60 per hour, benefits included, for new construction in Manhattan south of 96th Street with 300-plus rental units. A second component applies to buildings of the same size in Queens and Brooklyn Community Boards 2 and 1, an area that roughly includes Astoria, Long Island City, Greenpoint, Williamsburg, Brooklyn Heights, and Fort Greene, plus any eligible construction within one mile of the Brooklyn-Queens waterfront. On these 421-a eligible projects, construction workers would be paid $45 per hour, benefits included. The third portion paves the way for opt-outs. Any 421-a project where more than 50 percent of rental units are reserved for below-market-rate households is exempt from wage agreements, and these affordable units would remain so for 40 years. The property tax exemptions on these sites would be active for 35 years, up from 20 under previous 421-a rules. “We are pleased to have reached an agreement that will permit the production of new rental housing in New York City, including a substantial share of affordable units, while also ensuring good wages for construction workers," REBNY chairperson Rob Speyer said in a prepared statement first shared by Politico. The governor expressed measured approval, too. "The deal reached [last Thursday] between these parties provides more affordability for tenants and fairer wages for workers than under the original proposal," Governor Andrew Cuomo said in a prepared statement. "While I would prefer even more affordability in the 421-a program, this agreement marks a major step forward for New Yorkers." The proposed deal would apply to a 421-a bill passed (but not signed into law) by the state legislature in June of last year. That agreement would apply citywide, and it includes provisions that developers must hire independent auditors to review payroll. Developers will not have to hire unionized workers as long as they enter into labor agreements voluntarily with unions. If state legislators sign off on the REBNY and BCTC agreement, 421-a will be revived. Cuomo has indicated he will sign the changes into law in a special legislative session prior to the regular session that begins in January. Concurrently, the governor is urging lawmakers to sign a Memorandum of Understanding to release $2 billion in funds to build affordable housing for low- and middle-income households statewide. Right now, that money is entangled in other negotiations. In New York City, Mayor de Blasio is still reviewing the proposal to see if it passes his administration's standards. Politico points out that the deal that a similar he designed in association with REBNY last May was criticized by the governor. For their part, affordable housing developers are not pleased by the deal between the powerful groups. "Adding an additional 10 years (to the) exemption, on top of (an) already grossly excessive 25-year proposed exemption, yields a tax break that is unprecedented and unjustifiable on any fiscal or programmatic grounds," Benjamin Dulchin said in an email to Politico. "[It's] unconscionable on its face." Dulchin is the head of the Association for Neighborhood & Housing Development, a group that represents affordable housing developers. Since 421-a expired, applications for residential construction have dropped precipitously, so affected industries are hoping its revival will spur new construction. 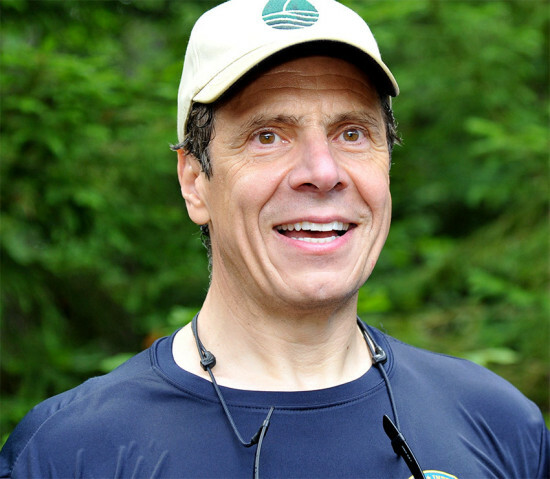 The New York Times has published a blockbuster story on the Cuomo administration’s repeated efforts to undermine the anti-corruption commission that the governor set up himself. According to the Times, the Cuomo administration blocked efforts by the commission to subpoena the Real Estate Board of New York (REBNY) over “its political donations, its materials related to a valuable tax break for new housing, and its communications with public officials, including phone calls with lawmakers." The commission also planned to note emails from Extell Development Company, which mentioned how a loophole could be used to funnel money to Cuomo through LLC's. Ultimately, the loophole was mentioned, but Extell was not. Some heavy hitters are lining up to knock down a proposal to landmark Brooklyn's downtown skyscraper historic district. 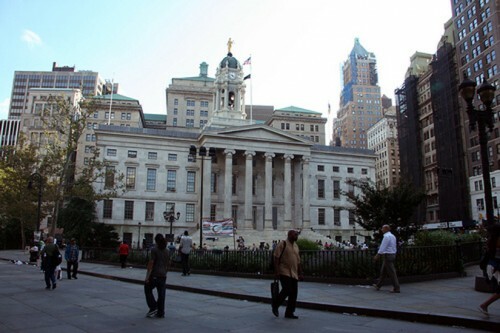 The Brooklyn Newspaper reported that everyone from the Brooklyn Law School to the Real Estate Board of New York say that the proposal will stunt growth in the area. Not surprisingly, as we reported back in December, the folks at 75 Livingston are still raising a stink of what it will cost them as one of the few residential buildings in the district. Proponents say that landlords are posturing to push for a major retail district and don't want the limitations brought about by landmarking.